Recently, I ran out of glue chip glass and decided to learn how to make it myself. Everyone has probably heard of glue chip glass, and the process isn’t a difficult one, although it is much more work than expected. Glue chip is a process where the surface of the glass is roughed up, either by sandblasting or by rubbing the glass with a grit slurry. I did try some acid etched glass with limited success. 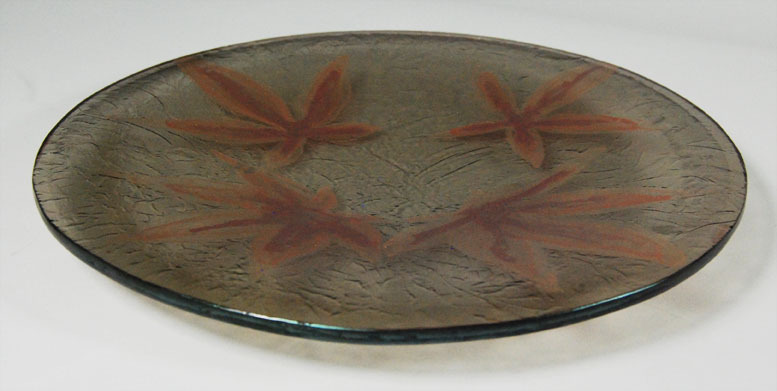 The next step is to pour or brush a layer of hot hide glue over the surface of the glass. I use small crockpots that I bought at the thriftstore for a few dollars each as glue pots. As the glue cures, it contracts, peeling the top layer of the glass off and leaving a frosty fern pattern behind. You can easily add contact paper cut outs, or leaves to the glass to act as a resist, leaving some parts of the glass not chipped. These parts will still have a frosty look from the grit, but will fire polish when slumped. Glue chip glass is best used in slumping applications, a full fuse will melt the texture out of the glass. I like to paint glue chip pieces with mica, both the glue chip sections and the frosted sections hold the mica well. If you’d like to try painting glue chip glass, without the hassle of making it, some of these very pieces are available in the shop. Here is a little video of the glue curing, it contracts and peels off by itself, and can be quite exciting.